Many thanks for the kind words Greg, Joe and Lynn! Holy water hmm...perhaps another business opportunity . I�m not certain on the roof material, my first guess is tar paper shingles but I don�t know if they used those so early. Anyhow I�m planning to divert here using wood shingles instead. I thought perhaps naming it "Grove" or Redwood Grove" but as it is now it is named "Cathedral Springs". 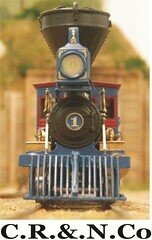 I have a siding for an industry near the station and a Full Steam Ahead "The barrel factory" kit that I bought some years ago of which I think of making a bottling company instead called "Cathedral Springs Mineral Water". 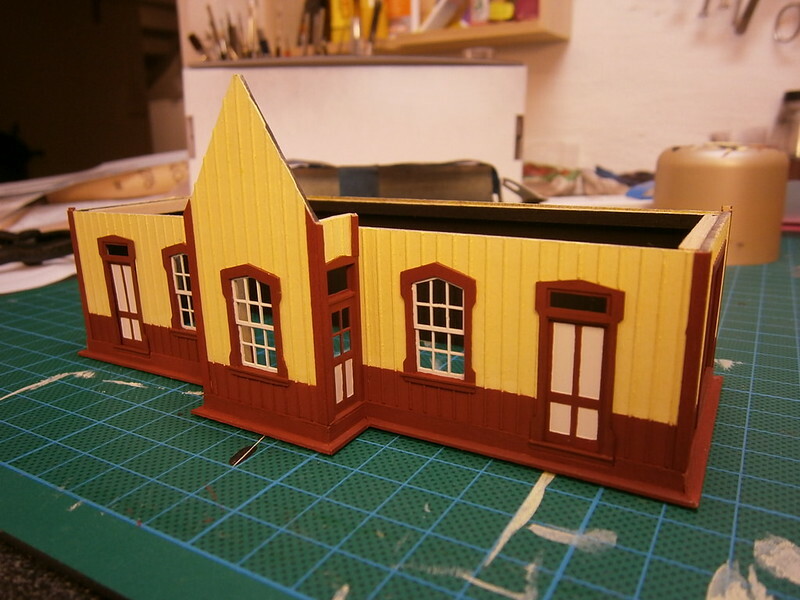 So at the moment I�m both itching to start on the kit and the depot. I guess I have to toss a coin. H�kan,thanks for that cool link about Cathedral/Fairy Ring trees,they are very beautiful! Cathedral Springs,sounds like a heavenly drink. 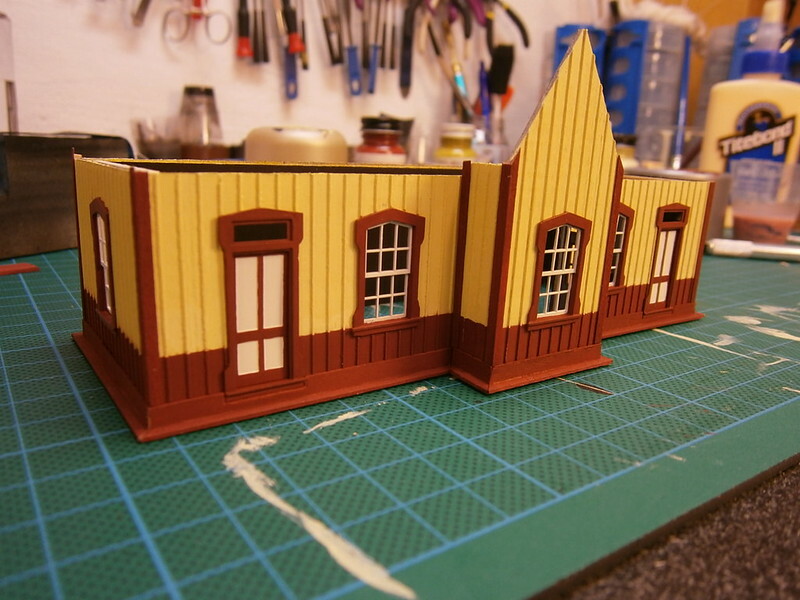 Having already built the FSA Barrel Factory which is a great little kit. I vote for the Cathedral station first!No coin toss. No coin toss then Greg . 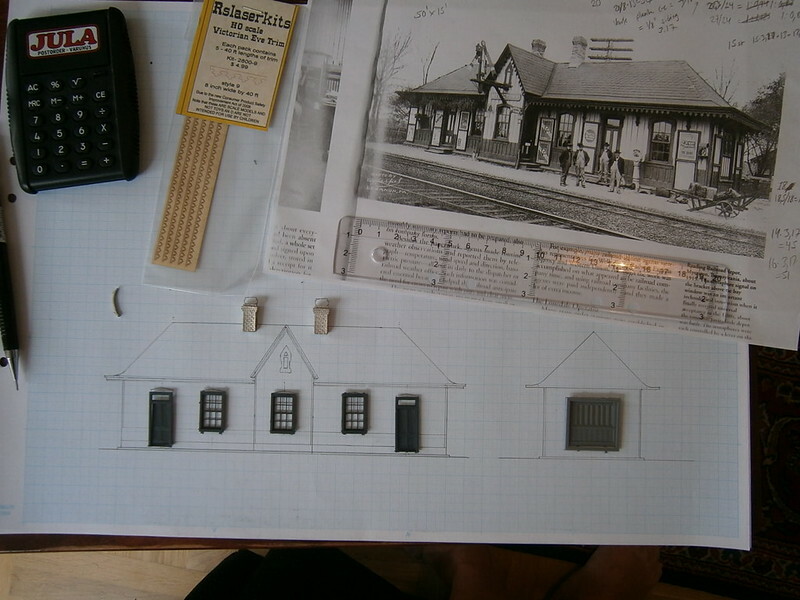 It has been a busy work week but yesterday I started by making a sketch on the depot. Also my last excuse not getting started arrived in the mail in the form of some Grandt line windows and doors. 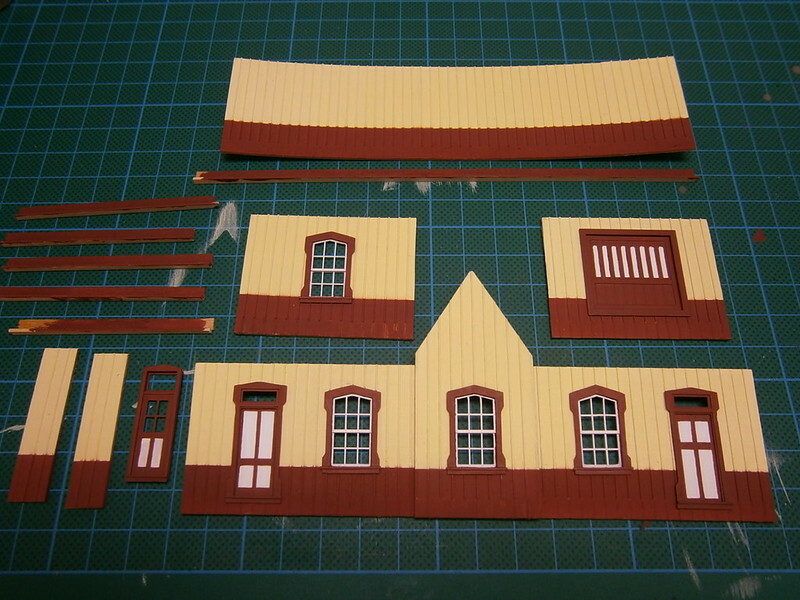 I thought of using commercial windows and doors as much as possible as this is one of my first building scratch builds and I'm a afraid I won't get the windows and doors neat enough. I made the sketch with the commercial windows and doors as reference and from them proportioned out the rest of the dimensions. I sketched on what here is called millimeter paper. The building came out approx. 50'x15'. A little to long for my space so I see if I can condense it a little more. I don't know how the back of the building looks so I'll only put some windows there for a see through look. The back will be hidden from the viewer anyway. 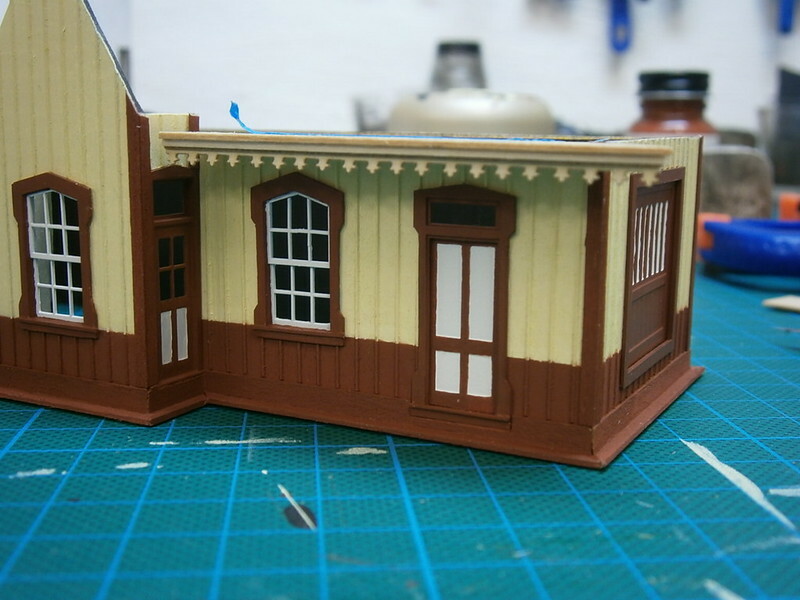 I'll try to modify the windows and doors to look a little more like the ones on the prototype photo. I'm not very knowledgeable on styles but I think the windows are in gothic style?? Goes well together with the name "Cathedral Springs" also as it has a little "church" look. There is a hatch (I think it is anyway) above the middle window as it seems to have some hinges. This is made to look like a window also in Gothic style(?). It must have been there for the depot personnel to be able to do some maintenance on the semaphore. 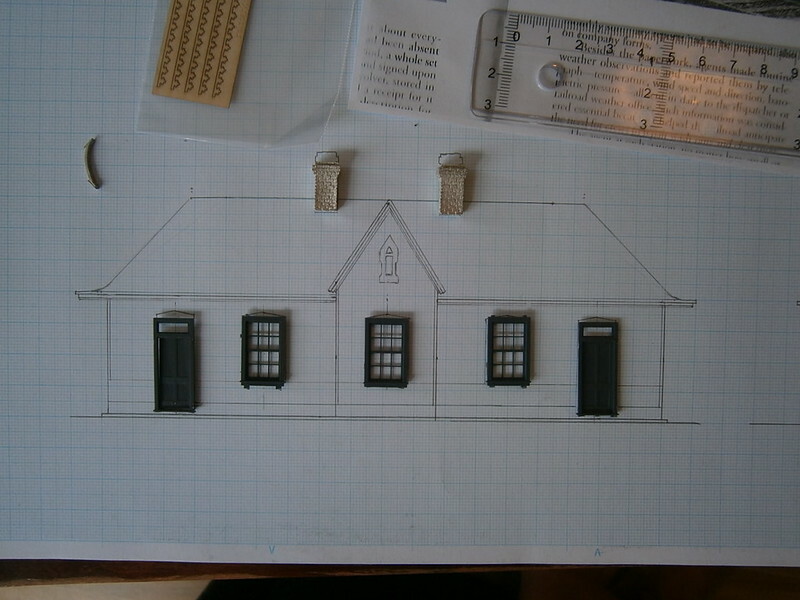 I found some Victorian laser cut trim from RSLaserkits which I�ll use under the eaves. One thing I have thought of is making the roof pitch steeper as the depot is in the Northwest. As it is now I have drawn it with an angle of 1:1 or 45%. It is difficult judging from the photo which the angle is but I thought if I got the width of the building and the height right I would get the angle also right. The doors and windows will be altered to look a little more like the photo. The baggage door is a bit too large, I�ll see if I scratch build a new one or change it. I�ll think perhaps it is more appropriate when I continue that I make a thread of this build on the Mike Chamber�s Craftsmans corner instead then on the Early rail forum? Hopefully I also get loads of help and suggestions during the build. H�kan,great to see you have chosen this Cathedral station as your next cool project! And that you are off to a great start. Here, or in another separate thread, I will be along for the ride. Your plan for Cathedral Station looks good H�kan. Thank you Frank, as a complete novice on architecture that is exactly the information I'm after. Thank you also for the link to Rusty Stump. I wish I had seen them before I ordered the windows and doors. I see if I can modify the ones I have. Thanks Bob, I value your opinion as I have very little architectural knowledge. I have been thinking on the colors for the building. White/light grey for the lighter parts and dark red/brown for the dark parts and trim. Perhaps also a third contrasting color. Good luck with the station, Hakan! The "hatch" in the bay window gable appears to my eye to be a decorative attic vent. Very common in my neck of the woods due to heat and humidity, and thus often reflected in my modeling. Northern California may not have the heat, but there is humidity aplenty! The last 10 day postings gone . Well I guess way better than everything gone. And the forum works great now. I have had problems with it for some time but I thought it was my computer. I'll make a new update tomorrow. And I'll thank you Martin for your kind words . For those who missed the deleted postings the colors I'm using is Polly Scale ATSF Catwhisker yellow for the light parts and Light freight oxide red for the dark parts. The white is Vallejos offwhite. And now for something completely different, the La.......a well I mean the Depot. I have assembled the walls and begun on gluing the bottom boards and corner boards. Next will be some more inside brazing together with the floor. As I'm not making a interior I'll make the roof mounted to the walls and not removable. I think I instead will make the house removable from the floor. I used a different camera this time and somehow the light parts came out a little to stark in the photos. They are more like the photo at the bottom. What a bright & cheery looking station! Thanks Greg. Well a little bit too cheery for me But....I have adjusted the camera and it now gives better colors. 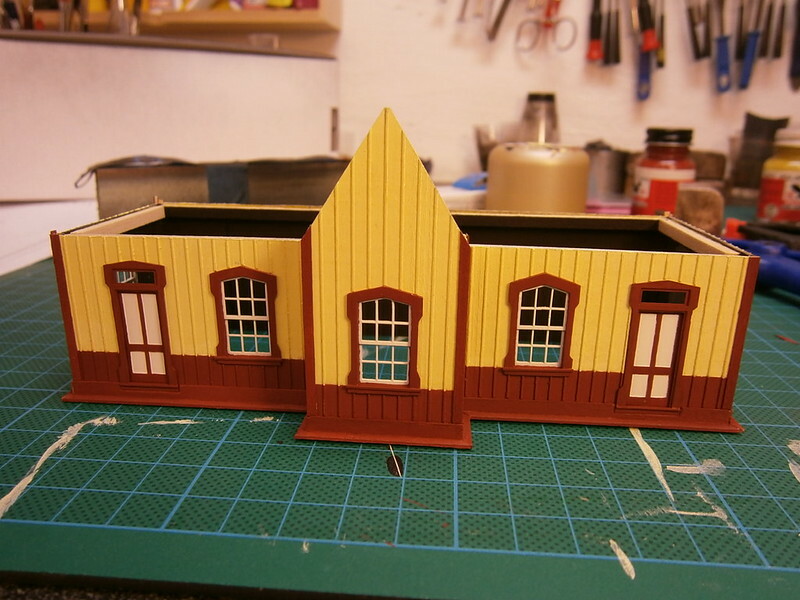 I have begun on the overhanging roof trying different variations until I found a one that I'm happy with.